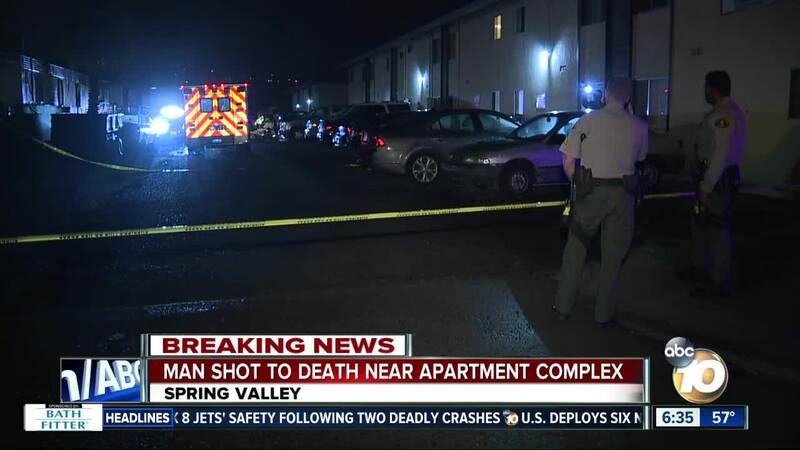 SPRING VALLEY, Calif. (KGTV) – Deputies are investigating a shooting in Spring Valley that left a man dead early Thursday morning. According to sheriff’s officials, the shooting was reported at around 1:30 a.m. at an apartment complex near the 8900 block of Delrose Avenue. Witnesses said they saw small flashes in an alley at around the same time gunshots were fired. Responding deputies found a man lying on the ground with gunshot wounds. Attempts to save the man’s life were unsuccessful, as the victim died a short time later. As sheriff’s homicide detectives investigated the shooting, a man who identified himself as the victim’s father arrived at the scene and pleaded for more information. No information regarding a suspected shooter was not immediately released. Sheriff's officials said Elkelton Boulevard, between Crestmore Avenue and Delrose Avenue, could be shut down for at least six hours.